Why the stories you tell yourself, about yourself can change your life! Stories we tell ourselves? Yes, if you pay attention you’ll notice that every human being runs mental stories about the world, other people, the weather, the list goes on and on. This “self- talk” can be around gratitude or appreciation of the good things in your life and it can also be about YOU. The problem is when we start labelling ourselves with negative stories. I’m sure you’ve heard other people say things like, “I’m not smart enough”, “I’m ugly”, “I’m not motivated”, and if you take note you’ll also see that you have a range of negative stories you tell yourself. “I’m not [Fill in the blank] enough”! The diagram below illustrates how all this works. We have these negative identity beliefs around “I’m not [fill in the blank] enough.” They fuel our thoughts and perceptions. 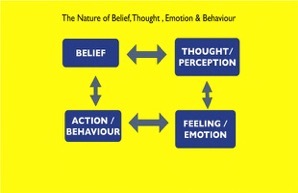 These negative thoughts have an effect on our emotions and how we feel drives what we do – our actions. How would you think different? How would you act different?